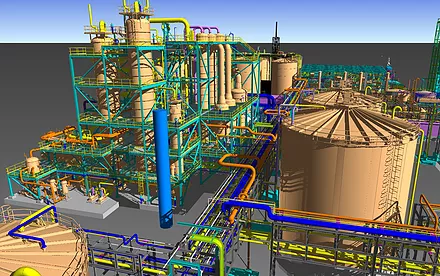 We use the latest plant design software to generate highly accurate, intelligent 3D models containing all aspects of your project. 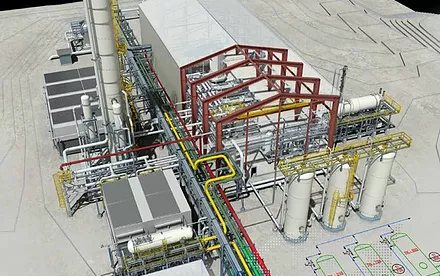 Utilizing the most advanced 3D plant design software, we're able to maintain extreme precision in designing both brownfield and greenfield projects. We have developed rigid, proven engineering design standards to guarantee a successful project. We've proven again and again how our techniques and procedures can save time and money during detail design/engineering all the way through construction. Whether designing a $100m project or a $10k project, we'll give your project the same professional level of detail and attention. A strong building begins with a solid foundation. The same holds true for a successful project. We begin with a streamlined building or plant layout. We'll work with your engineering, operations and maintenance staff to create a solid road map of your new facility that will accomodate everyone and every task. We will work side by side with your process and mechanical engineers to help develop P&IDs/PFDs to your standards. 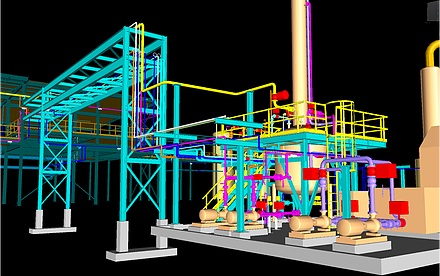 We use the latest in "smart" P&ID technology that allows us to create a dynamic link to the 3D model database. All symbols contain full design data and all lines contain operating and specification data. This allows us to query the P&ID database to obtain prelimiary BOMs, line lists and other reports. Structural steel can be a very basic model showing beam sizes and overall dimensions or fully detailed per your project requirements. All staircases & ladders are shown to allow your personnel to review access and daily workflows. Included in the structural design are any heavy structural pipe supports. This allows these supports to be included in the structural steel fabrication, removing it from the site contractor's scope. Also shown is basic handrail and grating design. 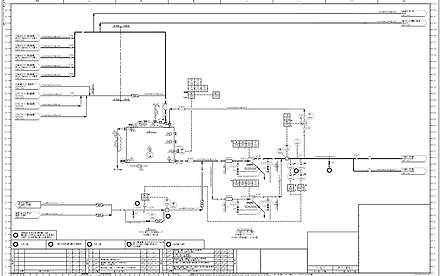 Where applicable, Vessel & Equipment modeling is done to exact vendor drawings to show true spatial representation. We will work with the equipment vendor or fabricator to determine optimal nozzle orientations. This allows for full shop fabrication of all piping, reducing and sometimes even eliminating field modifications and welding. 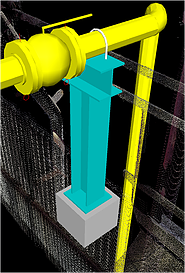 Anchor bolt locations can be included in the 3D model to allow for detailed foundation design. In addition, modeling equipment true to size allows for better planning and structural design as well as eliminating interferences. A good piping design can make or break a project. 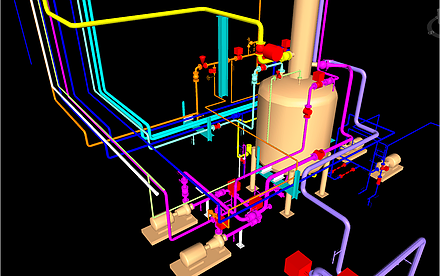 Our team has a combined 60+ years of industrial plant design experience, specializing in piping design. 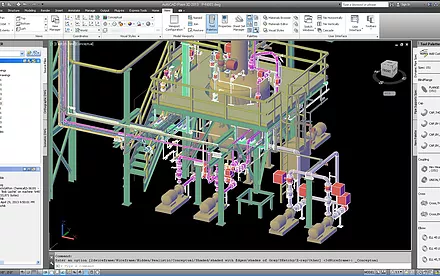 We've been intelligent 3D modeling - or BIM - for over 20 years. We were BIM before BIM was BIM! In-line specialties such as orifice plates, steam traps, etc. The final product is a highly detailed, highly accurate representation of your new facility. 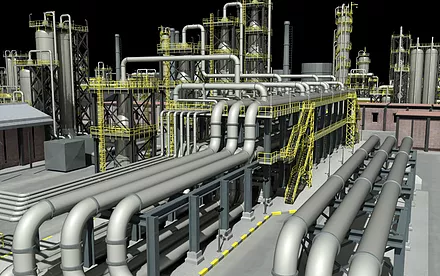 After combining all of the piping, structure and equipment models into a single Navisworks review model, we'll walk through each line with your team, item by item, ensuring everyone is pleased with the location of each component. This step has proven to be extremely helpful in allowing operations and maintenance personnel the opportunity to comment on the most operationally efficient valve/instrument placement as well as accessways throught the facilty. 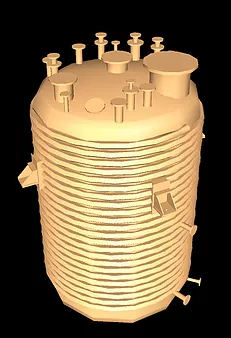 You could have the most advanced, well thought out, perfectly planned 3D model but if your documentation is poor or incomplete, what good is all this? We pride ourselves in our final deliverables. We spent the vast majority of our careers catering to the construction team. We've carried this philosophy over to Dynamic 3D Solutions. Our isometrics include details on all components required for installation from pipe & fittings to bolts & gaskets. We have the capability to provide detailed plans & elevations, bills of material, support details, etc. 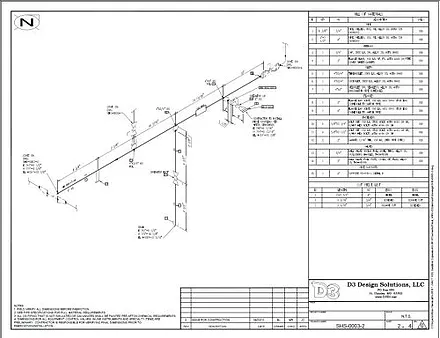 Piping plans & elevations are offered as an optional deliverable. Many smaller maintenance projects may not require a piping plan, however, we've found that in most cases it's time well spent. Without these drawings the contractor will spend much more time & YOUR money trying to figure out the isometrics if they don't have a plan - or road map - to go by. 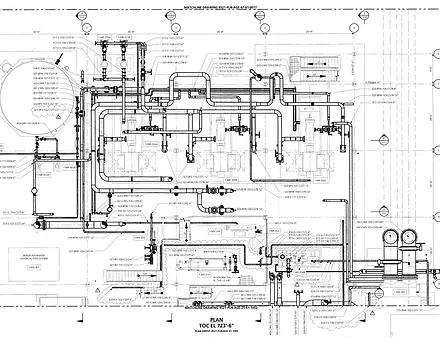 The piping plans contain an overview of the drawings but include details such as tie-in locations, structural colum lines, equipment locations, etc. We have over 100 standard pipe support details in our library allowing us to quickly and eaily find a support to fit your needs. The support details we have are tried and true - used in real world applications with a 30+ year track record. We can also use your standard pipe support details or create custom supports if required. We can provide detailed supports for all lines, all sizes, or just certain sizes per your project requirements or needs.